From WIKI: The Trollfjord (Trollfjorden) is a 2 km long sidearm of the Raftsund between the Norwegian archipelagos of Lofoten and Vesterålen. 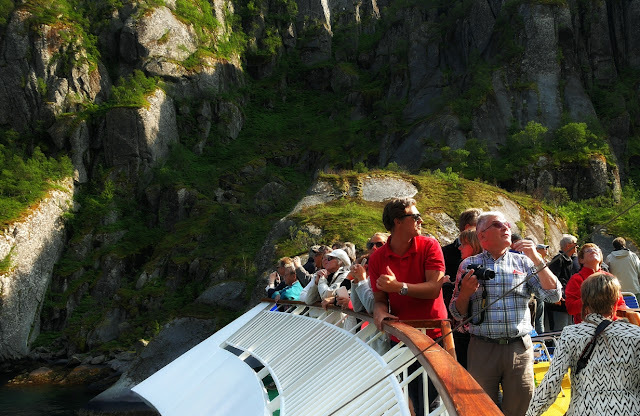 With its narrow entrance and steep-sided mountains, Trollfjord cuts westwards from the Raftsundet strait. The name is derived from troll, a figure from Norse mythology. 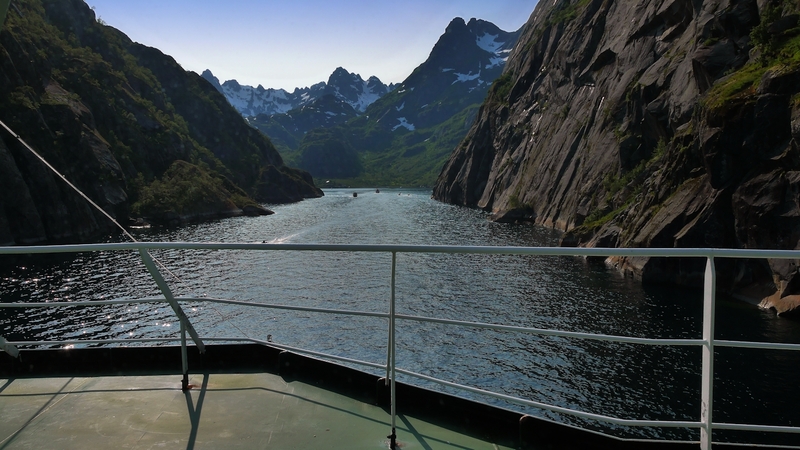 The mouth of the Trollfjord where it joins the Raftsund is only 100 meters wide. 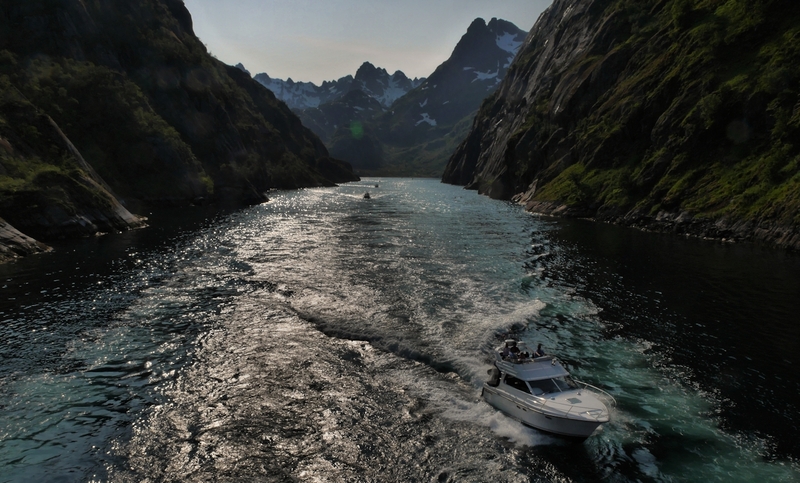 The fjord widens to a maximum width of 800 meters. 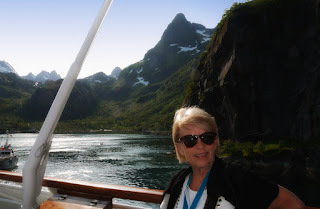 The mountains surrounding Trollfjord are between 600 to 1100 metres high. The Trollfjord is 72 metres at its deepest point. The highlight of the day is looking opp to the mountains surrounding this little narrow fjord up in Lofoten. Looking the other way - out of the fjord - where small boats are coming and going all the time this fine summer day. 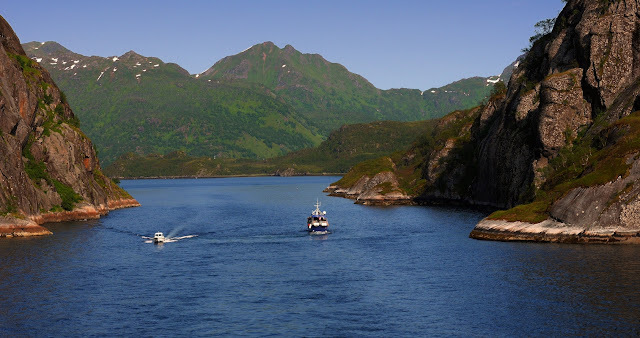 After some delay in turning the ship in the end of the fjord we are steaming out of the fjord bypassed by some cabin cruiser. "Note that the word fjord in Norwegian has a meaning that's basically "bay", while in english it's more like "bay with steep cliffs". 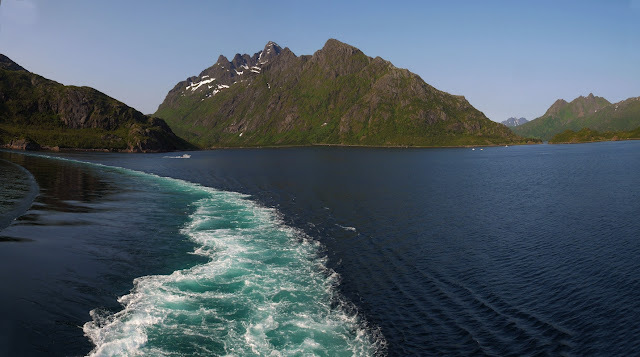 We heard one other passenger saying "his only regret regarding the cruise is that he didn't see any fjords". Ironic." What a piece of argument but 100% in accordance with this question asked to a tour-guide some time ago: "When are you closing the fjords in the evening?" The use of the word fjord in Norwegian, Danish and Swedish is more general than in English and in international scientific terminology. In Scandinavia, fjord is used for a narrow inlet of the sea in Norway, Denmark and western Sweden, but this is not its only application. In Norway and Iceland, the usage is closest to the Old Norse, with fjord used for both a firth and for a long, narrow inlet. /Ref. WIKI).